As the name implies, this indicator gives reliable BUY and SELL signals on your chart. NO FANCY INDICATORS, NO MESSING WITH YOUR CHARTS. 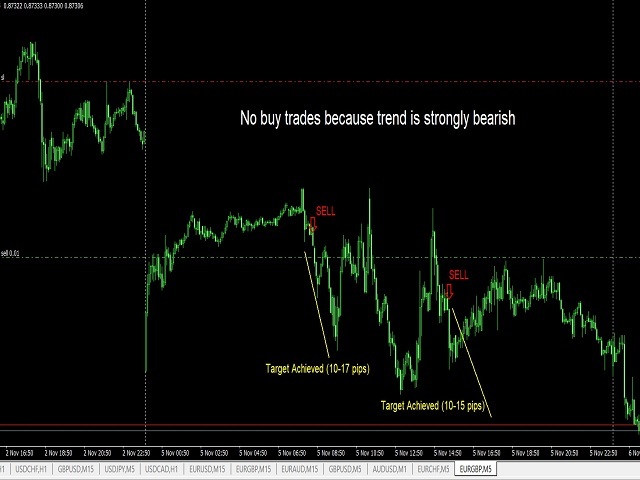 IT DOES NOTHING TO YOUR CHARTS EXCEPT TO SHOW ARROWS FOR BUYS AND SELLS. It DOES NOT repaint and has alerts and notifications which you can allow. It has chart notifications, mobile and email notifications and alerts. 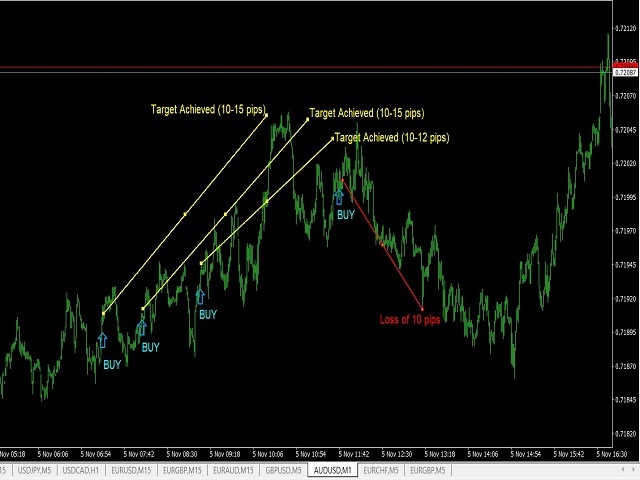 THIS INDICATOR PRODUCES ABOUT 85% ACCURATE SIGNALS WHICH IS VERY ENOUGH TO MAKE YOU PROFITABLE. SIGNALS IN THE DIRECTION OF THE TREND AND MOMENTUM MAKING IT HIGHLY RELIABLE. ALSO, BECAUSE IT DOES NOT PRODUCE VERY FREQUENT SIGNALS, IT IS BETTER TO TRADE MULTIPLE PAIRS AT THE SAME TIME, EVERYDAY. The time settings are included so that you can decide when and when not to show signals. trade about three (3) or more pairs at a time every day. One (1) pair only is not enough. minimum amount $100, use lot size 0.01, trade only two or three pairs. If you have a bigger amount, trade more pairs (about three to five) and calculate your lot size accordingly. when a signal comes and you take the trade, you should also take the next signal even if it is opposing signal. I mean take buy trade too even if sell trade is still running. 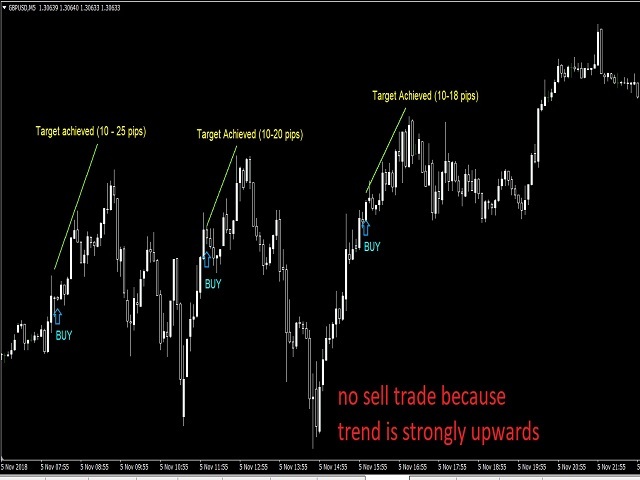 As long as stops are not hit, leave the trades running until the recommended levels or number of pips is reached. make sure you allow alerts and push notifications with sound, to help you not to miss signals. YOU DON'T NEED TO BE BY YOUR CHARTS ALL DAY SINCE THE ALERTS WILL NOTIFY YOU TO BUY OR SELL EVEN IF YOU ARE AWAY FROM YOUR COMPUTER. sometimes there may be stop losses which you must learn to take gracefully and still stick with the plan. NO MATTER HOW BAD A DAY IS, STILL STICK WITH THE PLAN (the recommended settings and levels). NEVER INCREASE THE RECOMMENDED STOP LOSS. IF YOU WANT PROFIT TO RUN, MAKE SURE YOU TAKE HALF PROFIT AND USE TRAILING STOP FOR THE REST. EVERYONE AS SOON AS I AM ABLE TO.